In my schoolroom, there is a National Geographic map of Ireland and Great Britain pinned on the wall. When I become distracted I always seem to gaze up at the map. Most of the time I notice something new or something that I had never noticed before. On the Ireland map, which I believe is where our teacher is from, everywhere I look there is some strange new name of a city, river or mountain that I missed. Do you know what the longest river is in Ireland and the UK? It is the Shannon, a 240 mi long river. That is pretty short for the biggest river in any area. Next I skip over to England to study it. 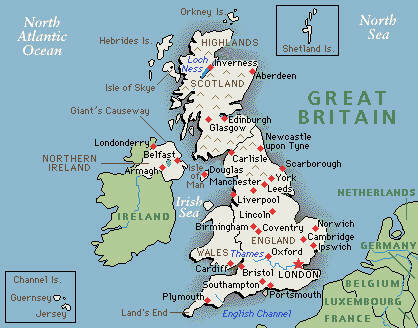 You may not have known this, but the island of Great Britain is actually one of the largest islands in the world. Scotland's northwestern coastline is jagged and rocky which has a remarkable resemblance to Norway, only about 300 miles away. Then I look down to view England and Wales. But before I can, my mom yells out: "Thomas, get back to your work!" Great, I was just getting to the best part. Did you know G. K. Chesterton discovered England? That's what he said in the introduction to his book called Orthodoxy.